State Senator Jason Rapert said he was locked out of his Twitter account after his comments about Muslim people. 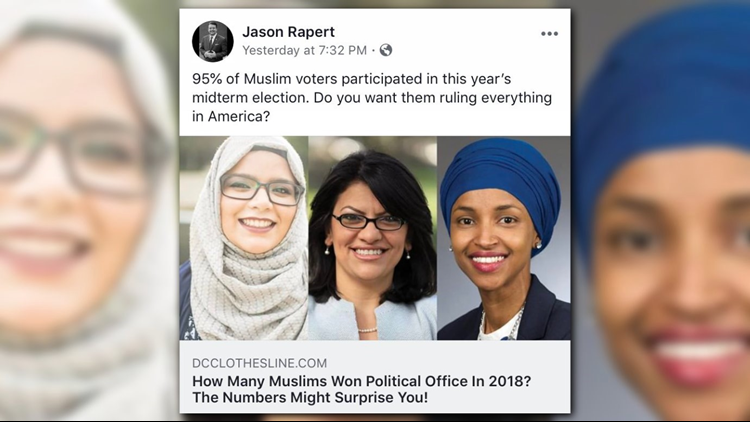 On November 30, Rapert shared an article from DC Clothesline and pulled a quote from the article that said, "95% of Muslim voters participated in this year's midterm election." He then asked, "Do you want them ruling everything in America?" Then in a tweet to another user he said, "If you read this article and don't see real political concerns then you have a problem perceiving news." Several people online have criticized Rapert for his comments, including the Council on American-Islamic Relations (CAIR), which asked for the Arkansas legislature to censure Rapert. "Senator Rapert's bigoted comments reflect dangerous ideologies of the past that should be repudiated, not promoted," said CAIR Government Affairs Director Robert McCaw. State Senator Joyce Elliott posted on her Facebook page that didn't agree with "smearing or even hinting at smearing Muslims for their religion." "When officials make statements like this, it poses a threat to the fundamental American values of freedom, democracy, & security," said Clarke Tucker, who ran an unsuccessful campaign for Arkansas's Second Congressional District. "Our nation's diversity is to be celebrated--not feared." The Arkansas Faith Caucus of the Democratic Party of Arkansas "categorically rejecting" Rapert's comments. Reverend Stephen Copley said that it was "disheartening when those who attack religious freedom are the very people who profess its importance and are elected to protect it." Chintan Desai was more direct, saying that Rapert was a "f***ing disgrace" on Twitter. In a Facebook Live video, Rapert said someone reported his response to Desai on Twitter where the state senator claimed that he would "offer some facts that warrant your study." "Islam is the only belief system I am aware of in the world that directs its adherents to kill anyone who refuses to convert to Islam or submit to Sharia Law," Rapert claimed in the tweet, which he held up on a piece of paper to the camera during the video. "Who would want to elect someone who believes this?" At the bottom of the paper, a message from Twitter said that Rapert's account was "temporarily limited" from some features for 12 hours because of the tweet. Rapert said that he would appeal the decision by Twitter. He also said that he wasn't going to give into the "liberal bias that is going on in the country trying to squelch and silence the voices of Christians in this nation and especially Christian conservatives." We've update the article with Sen. Rapert's full statement.